John McAfee escaped police and lost his fortune. Now he's enjoying art in Canada. John McAfee fled Central America and is now living in Montreal. He escaped a police manhunt in Belize. He survived a Guatemalan jail. And now John McAfee is reveling in Montreal's art scene. 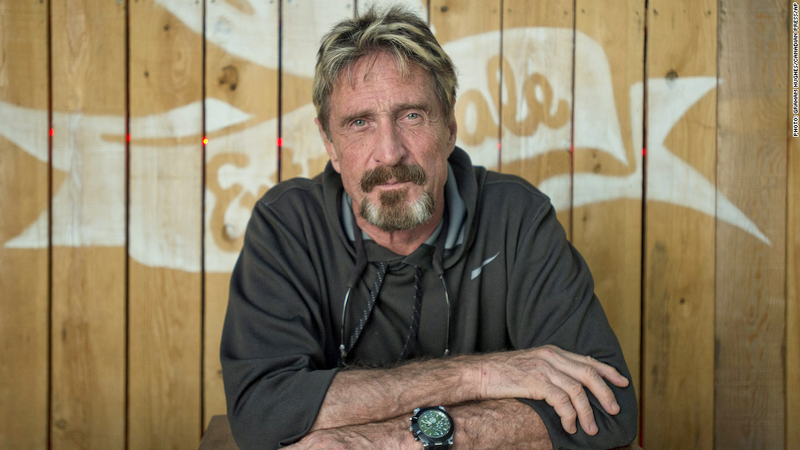 After a wild year that made his name synonymous with crazed outlaw, McAfee is back in the news. Intel (INTC), the tech company that bought McAfee's antivirus software company in 2010, decide to rebrand it Intel Security earlier this week. So we figured an update was in order about John McAfee, the eccentric millionaire who helped create the software that lives on so many of our computers. On Tuesday, McAfee told CNNMoney he's lost everything. Only a tiny fraction of his one-time $100 million net worth survived the 2008 market crash. But his fortunes really took a hit in 2012, when McAfee fled Belize police who aggressively sought him for questioning on the death of his neighbor. The government raided his jungle compound and seized everything inside. The buildings on McAfee's property later burned down under suspicious circumstances. "Everything I owned was in Belize. I left with nothing in my pocket," he said. McAfee said most of his remaining riches were in the vast art collection he left behind. He claims that the Belize government auctioned off many of his belongings, but his art pieces never showed up. McAfee is now living in an apartment in Montreal, Canada, with his wife Janice. He's getting by on consulting work -- shelling out advice to firms on acquisitions, technology and internal restructuring. He loves to explore local restaurants. And he says he enjoys meandering through the area's art galleries. Now 68, McAfee is telling his life story in a feature-length documentary currently being worked on by Montreal-based Impact Future Media. When that's done, McAfee plans to head back to his one-time home of Santa Cruz, Calif.
McAfee's adamant that he's no longer on the run from police and that he is just trying to live in peace. Still, he feels the occasional need to stoke a fire. He said Intel lost a great marketing opportunity when he was being chased through the jungles of Central America. Instead of shying away from the McAfee name, Intel should have leveraged press about his misadventures and taken a more edgy approach. "Roll with it. Hire a creative marketing team and see what you can do with this," he said. Executives should have asked, "How can we do creative marketing to change Intel from a staid, stodgy company to a shaker and mover?" "There's something wrong with the marketing department. They're taking life too seriously," he added. Intel didn't respond to requests for comment.